The book drops in April, but there may be some ARCs for giving away and such. You might want to keep your eye on it if interested. You can do that not only here but by following me on Facebook and/or liking the book’s Facebook page to receive updates in your feed! 2015 started out with the release of Shadows Over Main Street, which Doug Murano and I worked tirelessly on. Had some problems with the publisher, publisher shut down, and we went looking for a new one for not only the first book but the Shadows Over Main Street Volume 2 that we are editing. Thankfully, we finally found one. We’ve also been working with Joe at Crystal Lake, editing Gutted: Beautiful Horror Stories for a 2016 release, and I am so pleased with how that book is shaping up. Incredible stories! Doug and I are discussing our next editing project and I’m excited to see what that becomes. I’m so thankful and couldn’t ask for a better partner in anthology creation and editing! I was fortunate enough to attend some events with my Virginia chapter of the HWA folks and to volunteer some time as a verifier with the organization. With 7Hills, I hung out a shingle to do some light, freelance editing work as well, so we’ll see how that goes. On the authoring side of things, Necro Publications released my urban fantasy/horror book, Blood Savages back in April. I served on and moderated some panels at RavenCon and Scares That Care as well as attended the World Horror Convention in Atlanta–an amazing experience with so many great people who I now call my dear friends. There’s even talk of contributing to a novella collection with a few of those fine writers, so that’s a prospect I’m very excited about. Publisher woes continued with Eldtritch Press shutting down and leaving my Gothic horror novel, Beneath Ash and Bone, in limbo…but I’m pleased that it’s found a new home with Bedlam Press for a 2016 release. All in all, 2015 was one hell of a busy year. I look forward to the next one, to making more friends, reading more, writing, editing and publishing more. Most of all, I am pleased as punch to continue being a part of this special freakshow that is the horror community. So many old and gracious souls here, and that fills my heart indeed. It’s time for a very special giveaway here on Goodreads! Due to a printer error, I have 29 copies of my novel, Blood Savages available for this giveaway. The catch is that they are slightly defective copies that were printed from a version of the book prior to approval of the final galleys. What does this mean? There are a few oopsies on the internal cover pages and the copyright information. They do not include a few of the final and–probably hardly noticeable–changes I made to the text of the manuscript. That said, it is still a fine-lookin’ book and the story is all there! My only other option is to chuck them or use them as kindling for the fireplace and I just cannot bring myself to do that to any book, especially mine. So…if you’re up for a rare paperback copy (collector’s item!) of Blood Savages from Necro Publications, then take a moment to register for this unique giveaway. I’ll even sign it special for you with some stupid remark about your willingness to accept a defective copy of my book. Get in on this unique opportunity today! Giveaway ends December 09, 2015. Well, I am pleased to report that I have finally found a home for my Gothic horror novel, Beneath Ash and Bone. Bedlam Press will be releasing it in late April of 2016, with a release party at RavenCon in Williamsburg, VA. You are all invited of course! Beneath Ash and Bone is a short, spooky novel in the Gothic horror vein, set in rural Virginia just before the outbreak of the Civil War. If you’re a fan of books/movies like Susan Hill’s The Woman in Black, then I think you’ll dig this one. There will be more info to come, certainly, and I’ll be sure to share that with you along the way. Very excited to see this one unleashed on the world! Unfortunately, Hazardous Press, whose anthologies I contributed several stories, who published my own short story collection and Shadows Over Main Street–co-edited with Doug Murano–is going on hiatus. This means a lot of titles have disappeared from the catalog of Amazon and other various places you could buy them from before. One of those is my collection, A Feast of Buzzards. It is no longer available on Amazon in Kindle or Paperback. I do still have some paperbacks, though, so if you want one, contact me about it. We’ll work something out. The future of this book and if/when/how/where it will be available is unknown at the moment. I’ll keep you posted. Shadows Over Main Street, Volume 2 is still happening. Again, we’ll share details when things are all settled. In the meantime, check out my novel, Blood Savages, for a fun and violent horror-superhero romp. And be on the lookout for my Gothic horror novel, Beneath Ash and Bone, coming from Eldritch Press in Spring of 2016. Not to mention there’s another Murano-Ward-edited anthology of stories, Gutted: Beautiful Horror Stories, due out from Crystal Lake Publishing in Spring/Summer of 2016. And, as always, stay tuned. I’ll update this undying blog as often as I can! 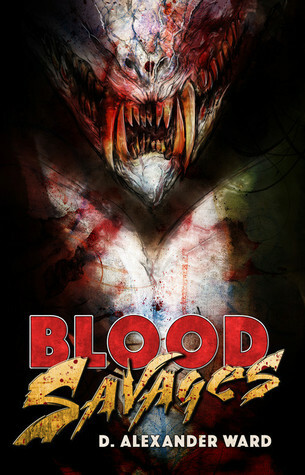 Time for an ebook giveaway of my action/superhero/horror novel, Blood Savages published by Necro Publications. To enter to win, you just have to tweet the message to your followers. So I guess this one is for you tweeters (twitterers, tweetsies?) alone. Available formats are .Mobi and .Epub. Giveaway begins July 11 and ends on July 15. Go! Richard Thomas’s novel, DISINTEGRATION, is a harrowing glimpse into a dark and desolate underworld that is threaded through our very own everyday lives and yet is always at the periphery of our vision. Set in Chicago and its environs, it is a study in how quickly and easily an average man can be stripped down and molded into a killer. “A flash of headlights, the squeal of tires on pavement, and the windshield of my car is filled with the sun. Metal screams and glass tinkles the air, I’m a feather drifting in a slow-moving current, I’m a fragile egg, cracked on the counter, shell splintering into tiny jagged pieces. The muted mass of the minivan in front of me is gone from my vision in the blink of an eye. Nothing remains. It’s all gone. A kaleidoscope of gray and white, slices of red and pinpoint pain scatters across my body. If you’re into dark, gritty, character-driven crime novels, you need to add this one to your e-reader. If it ever becomes available in paperback, it should come with bourbon stains on the pages, cigarette burns on the cover, and smelling of gunpowder. That is the kind of book DISINTEGRATION is.